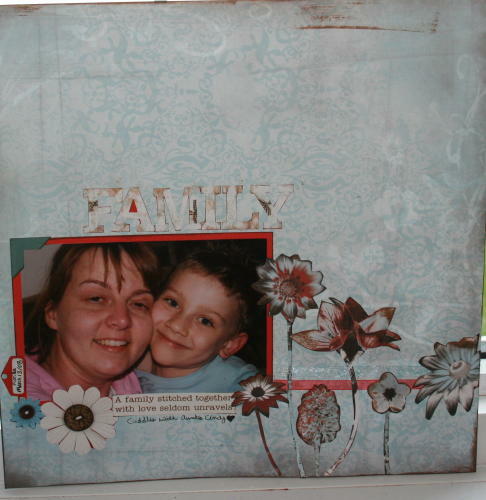 The next Storytellers Scrapbook Kit Layout is titled "family". I put the picture(glued onto cardstock and then trimmed) directly onto the patterned paper...if I like the paper enough I will not use cardstock as the base of my layout. I handcut the flowers from the matching patterned paper, and glued them over 2 strips of ribbon that I had already glued down. **I wasnt a huge fan of the diecuts that came with the kit, so I trimmed around them , so they were more my style(the corner piece the flowers on the left side of the layout, the title and the tab.